Paint ball is a sport that has advanced as the most famous and extreme game in the world. There are several forms in which the game comes in. But there are some basic methods that apply to all formats of this game. Some of the basic rules applied to all types are as follows: you divide the group into two even teams; start the play with the paint ball markers, mask, a tank of CO2 and a bag full of paintballs; then you work out with the teammates a strategy for completing the objectives; shoot on the opposing players and try to mark their chest with a colored ball and avoid yourself of getting marked; and finally complete the objective. The actual reason for playing the paintball is to bring together all the friends or other acquaintances and team up. There are many other intrinsic reasons behind playing paintball. Team building is the foremost concern as communication building is the effective key to play the game. Playing this sport also offers the players to tell something to other that you feel proud of. You will also consider this game as a life changing as you come physically bold and confident to cater any situation. 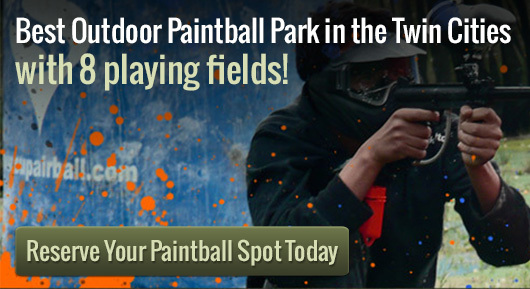 You will also consider playing paint ball as the most memorable experience in your life. We can accommodate any size group here at Action Packed Paintball. We can even support private parties of over 100. We are capable of running exclusive paintball games 7 days a week, from sun-up until sun-down. Remember to call us at 952-492-6776 in case you have any questions or if you would like to book a time. Please get in touch with us as soon as possible, as advanced reservations are required.